Did you know that you can develop intuition and improve your health at the same time? Well, you can, through the pineal gland. You may be asking, well, what is the pineal gland? The pineal gland, also known as the pineal body, is a small pine cone shaped gland that lies deep inside the center of the brain in the epithalamus. It is a part of the endocrine system and helps to regulate melatonin, which is a chemical produced in the brain that helps the body sleep at night. The pineal gland function lies in governing the production of hormones as well as the maintenance of the circadian rhythm, which is essentially our sleep/wake cycle. Almost all animals have a pineal gland and its role remained a mystery for a long time. The role of this tiny gland was one of the last to be discovered and has only recently begun to be understood. In fact, scientists are still studying it today and as of yet, it’s complete role and function has not been defined by researchers. It has long been associated with the idea of the “third eye”, which is a spiritual symbol of all-knowing according to yoga philosophy and often perceived as a gateway for the soul’s liberation. 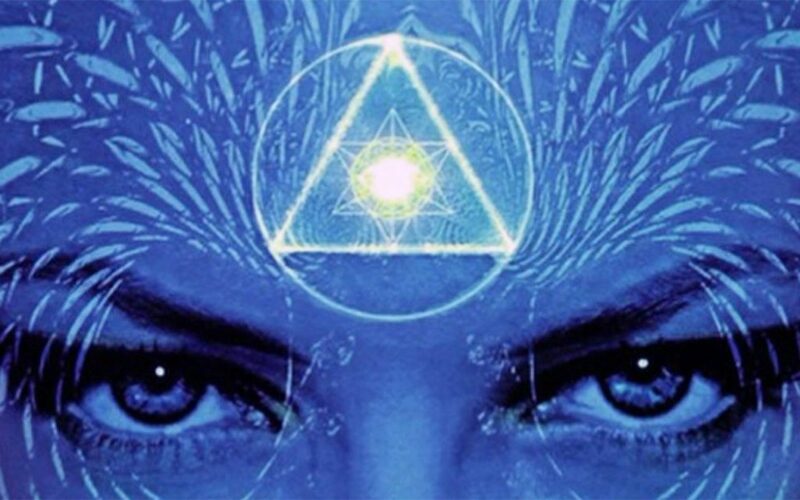 The idea of the third eye has also floated around science circles previously, as some believe the pineal gland is what has been leftover in the human brain of an actual, physical third eye which we eventually evolved out of. The gland itself is very small, about 1/3 of an inch long and is located in the center of the brain. It is a reddish-gray color and is primarily made up of pineal cells and neuroglia cells. Calcification of the pineal gland often occurs as a result of excess fluoride and other mineral deposits. This may, in turn, affect the body’s ability to regulate melatonin and its circadian rhythm. 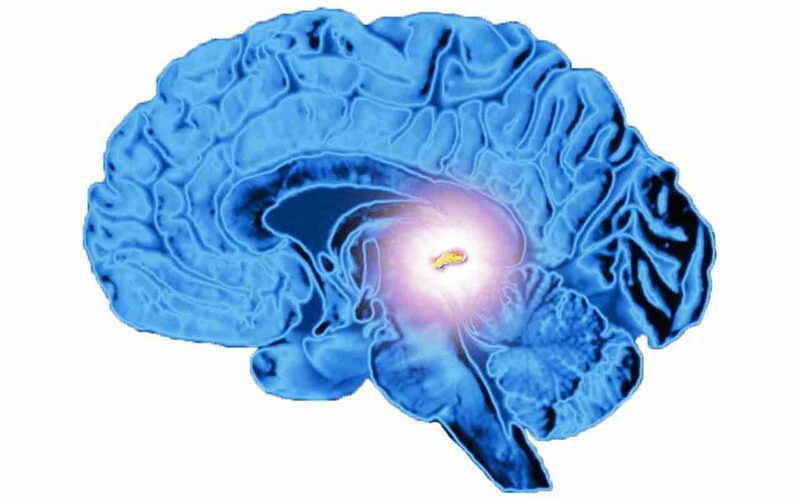 The pineal gland is photosensitive and secretes less melatonin during the day and more at night; hence, why most people are awake during the day and feel tired for sleep at night time. The pituitary gland is a gland that acts as a master gland, controlling many of the hormonal functions in the body. It is located in the hypothalamus in the brain, which also contributes to our sleep/wake patterns This means the pituitary and pineal gland work together for proper function. Imbalances in the pineal gland (and pituitary) can lead to sleep disturbances and problems with your sleep/wake cycle. Therefore, this tiny, little gland plays a bigger role in our lives than previously thought! In addition to the physiological role the pineal gland plays in the body, it is also commonly associated with spiritual thought and mystical experiences. Ancient sages and mystics believed this area of the body to be the space for ascension and enlightenment through the brain/body. It is perceived as a bridge between our inner and outer worlds, as well as to a connection to something beyond what we know to exist, to a higher state of consciousness. It was called the “seat of the soul” by French philosopher Descartes, although science has mostly discarded his sentiments. However, now that it has been proven that melatonin is in part regulated by the pineal gland, it does lend credibility to the fact that increased melatonin production can produce transcendent or mystical experiencesduring a waking state such as meditation through its function as a psychotropic chemical. Outside the realm of science, the pineal gland is associated with the sixth chakra, called ajna or the “third eye” center located between your eyebrows (essentially deep back in your brain). The ancient yogis who wrote The Vedas in India between 1500-500 B.C. outlined a long time ago these physiological and psychic energy pathways that run through the body as a map we can still use today to better understand ourselves. When you strengthen and activate the third eye, you awaken intuition and inner wisdom on the path to Self-Realization. It is the second to last step before reaching total enlightenment (according to yoga philosophy, which actually occurs through the crown of the head). 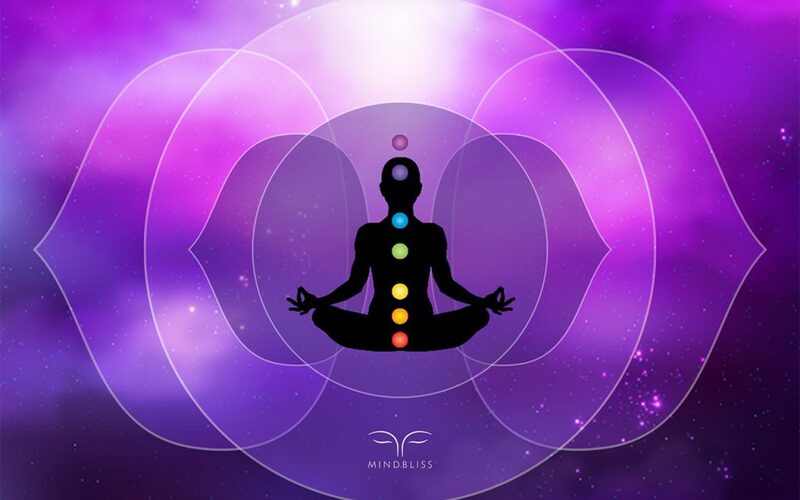 Psychic energy is said to accumulate in this area of the brain and body.However, in the grand scheme of the world, when this center is active and open, you can better understand your role in life and the various signs and synchronicities that occur and point you in the right direction. Symbolically, the third eye represents union on the path to cosmic consciousness, divine wisdom, inner knowing, and intuition. This is the place where the ego is left behind and the concept of duality begins to unwind in order to embrace unity or the concept of oneness. Using this powerful center can teach you to trust in divine while managing your ability to focus your life to the best of your ability and play your part in the world. When this occurs, your actions, words, and choices reflect this state of being and a more peaceful existence is possible. So how can you learn to amplify your pineal gland to live a better life? Meditation is one of the most popular ways to learn how to awaken your third eye and stimulate your pineal gland. Meditation stimulates the parasympathetic nervous system to relax the body and mind so that mundane thoughts of everyday life do not impede your ability to live a happy and healthy life. There is research to support the fact that people who meditate have higher concentrations of melatonin than those who do not meditate. Closing the eyes during meditation stimulates the perception of darkness by the brain, which may be a reason for this occurring. Mindfulness Meditation is a practical way to begin a meditation practice. Find a quiet spot to sit comfortably, close your eyes and follow your breath. Allow your focus to be completely absorbed in your breath. If your mind wanders, bring it back so that you become a witness to your breath. Over time, you can choose what your focus is- perhaps it’s a body part, or a sound, or anything you can imagine. According to ancient yogic philosophy, specific gazing techniques such as Trataka meditation can increase third eye activation. The most common way to practice Trataka is by candle gazing, or gazing at the flame of a candle without blinking for 1-3 minutes. Then, close your eyes and focus on the afterimage for several minutes until it disappears. You can repeat this several times in one session. Another way of practicing this is to focus your eyes on a specific point in space, called dristhi in yoga. A common third eye meditation involves gazing at a spot in line with your nose, then gazing at the tip of your nose, and finally, directing your gaze upward to your brow or third eye area (called Shambhavi Mudra). You can practice each gazing point for up to 10 minutes each. Visualization is another way to amplify the power of your pineal gland and third eye center. In chakra theory from yoga philosophy, the Ajna chakra or third eye is the color indigo, which is a deep blue-purple color. You can envision this color in your mind’s eye at the space between your brows or even deep back into the brain where the pineal gland resides. The Sanskrit word Ajna means “command”, so by visualizing this color here, you further activate your “command center” in order to live your life to its fullest potential by piercing obstacles in your path through your own willpower. In order for the pineal gland to function at its optimum potential, a balanced and healthy diet is essential. Fluoride, which is frequently found in water supplies and toothpaste, calcifies the pineal gland, which lowers its function. Therefore, a cleansing diet rich in super-greens like spirulina and chlorophyll will be very beneficial for keeping the pineal gland active through the detoxification process and nutrients they provide. Because the pineal gland is photosensitive, exposing yourself to full sunlight as well as immersing yourself in total darkness at night will help to maintain a healthy pineal gland. If total darkness is not regularly possible, try a sensory deprivation tank. Also called “float tanks”, these containers allow you to be immersed in a closed tub of water where you feel like you can float, completely cut off from all of your senses. The more that you practice these techniques, the more you will begin to ‘see’ a change in your life. Gradually, you will begin to notice a shift in your thinking, acting, and way of being. There are some telltale signs that your pineal gland is healthy as you activate your third eye center. Remember to enjoy the process and be patient with yourself as you try to incorporate these techniques to amplify the power of your pineal gland. This tiny little gland does a lot more than we give it credit for, so when we start to nurture this aspect of our mind, body and soul connection through regular healthy practices, big changes can happen. Let’s start amplifying the power of your pineal gland right now with a Mindbliss meditation called Pineal Gland Activation. Download the app by clicking HERE from your iPhone or Android. Tap into an infinite sea of wisdom as you chant or receive the sound of AUM and theta waves. This meditation has a tremendous activation effect on the pineal gland which often dries up from exposure to a range of chemicals found in our environment and due to psycho-emotional traumas. It’s a great way to calm your nervous system.